My Christmas tree is finally decorated. Last night we skipped the usual shopping after dinner and went straight home. I told Doug to take out the boxes of Christmas lights and ornaments and I finally got down to decorating it. I don't have many fancy ornaments but these are the the few that are special to me. This is the ornament that Doug got for us on our first Christmas together. I don't know why, somehow I thought it was his mom who gave it to us. Now that I think about it, I remember Doug saying he did try to look for an ornament where the lady had dark hair, but couldn't find any. 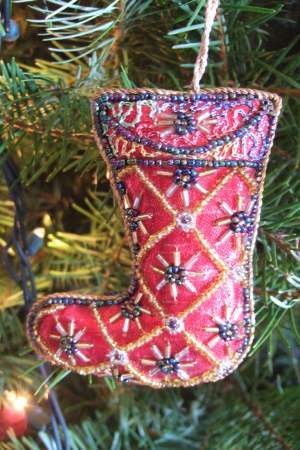 In 2002, I was invited to a Christmas party by one of my quilting clients. Except for the lady who invited me, I did not know anyone else at that party. It was an ornament exchange party and I got this one in exchange. That Christmas I was pregnant and I got sick in the evenings, so I didn't stay at that party very long. My mother-in-law and I bought several ornaments to commemorate Denice's and Duncan's first Christmas. I brought some of them with me to Miri because the babies had their first Christmas in Miri. Duncan was only four months old when we took him to Malaysia to meet Denice for the first time. 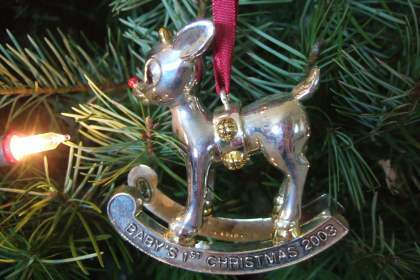 This is another one of those Baby's First Christmas ornaments. 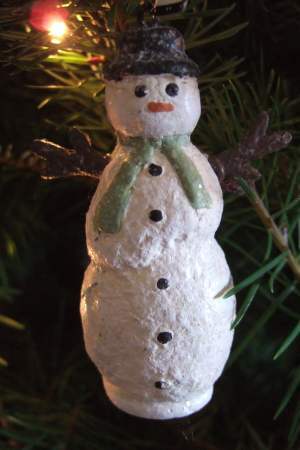 An another one of Baby's First Christmas Ornaments. We got two of the same ornaments for each baby. This and the following ornaments are those that I bought at the after Christmas sales! 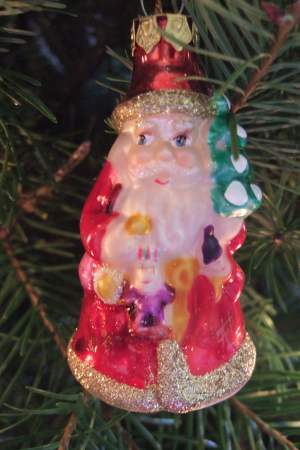 :-) I don't normally want to spend a lot on ornaments but when they are on clearance I cannot resist them! I love this beaded ornament. 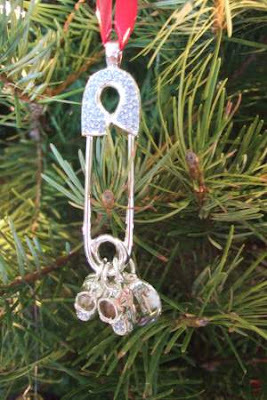 I love the glass ornaments but they can be quite expensive. This is one of a set of three that I got at an after Christmas clearance. How's your tree coming along? Hey Puteri ... I think your idea is an awesome one as the ornaments become treasure keepsakes instead of just tree decorations. I was planning on bringing in the tree (ours is a live growing one) this weekend but not patah kaki, not sure what to do. Let us know what D&D buy later?? We will get our live tree next week... Can't wait for that. Hi Puteri! 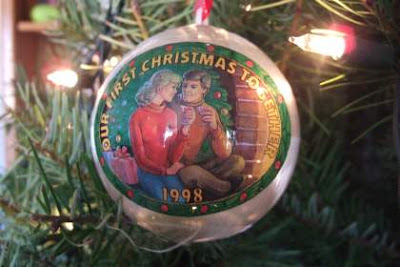 Great idea indeed having special ornaments to remember the years gone by. Your tree looks simple and pretty. Our tree is still in the store and I am thinking of putting them up over this weekend when my grandkids come to stay. Last night we were at Khols and most of the ornaments were half off. The kids got an ornament each. 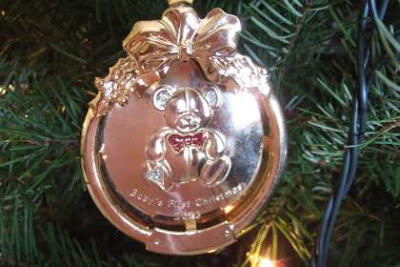 Daddy is going to write their name and the year at the bottom of the ornament. 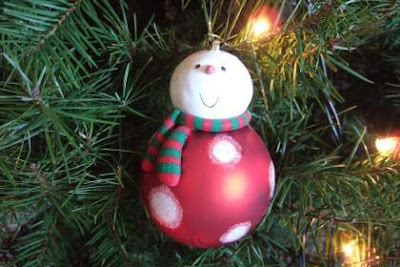 My next post will of the kids and their new ornaments. Yes, it's an awesome idea that I got from somewhere .. can't remember where I read about it. Last year we spent Christmas in Miri that is why the kids didn't get to pick an ornament that year. Rindu bala uchu meda Christmas tree, eh! what a good idea puteri! you smart little thing you! we dont have a christmas tree, but i buy those christmas ornaments anyway! this is the time of the year which i really love and look forward to! the decorations are marvelous and you'd find plenty of sweet little gems everywhere! and a day after christmas... the sale!!! 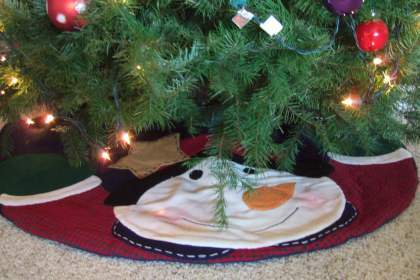 i love your christmas tree skirt! i didnt know there's a skirt for christmas trees! wrap yourself warm! thanks for visiting our page. 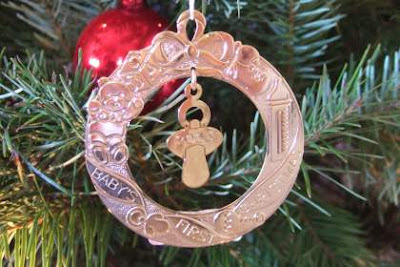 Aidan's mama, you could get one ornament for Aidan this year to commemorate the occasion! And yes, I love the after Christmas sale too! Haha. The Christmas ornaments are much cheaper then! Yes, Christmas trees have skirts. Next time I should remember to bring some for my mother and sisters-in-law back in Malaysia!